"Vietnamese or Japanese? ", I queried the kids as we pulled out of our driveway. After a brief moment, the kids unanimously decided Japanese food. Geez, when I was younger, it was eat whatever was given to you. Now we have my daughter demanding Macarons from Soirette and creme puffs from Beta5... Great, go into debt to fund my daughter's luxury food items. At least my son loves Kraft Dinner, we can save money there. 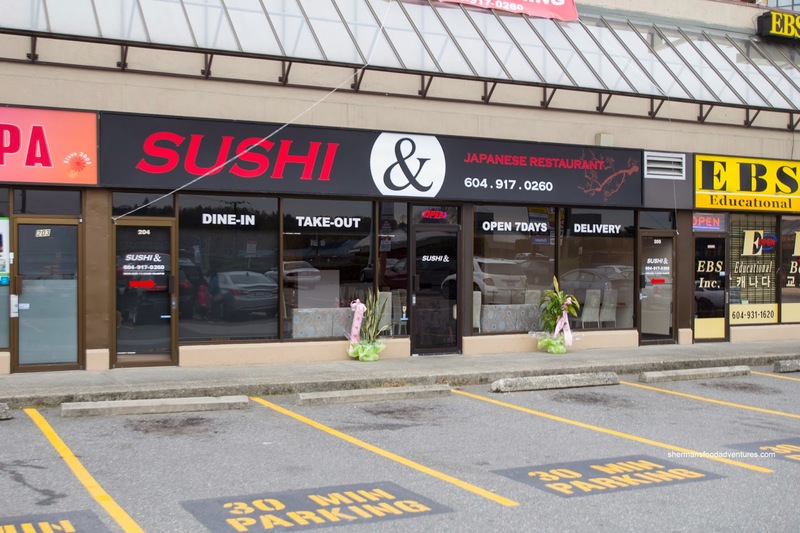 Ultimately, we ended up at a new place called Sushi & (or is it Sushi Ampersand???). 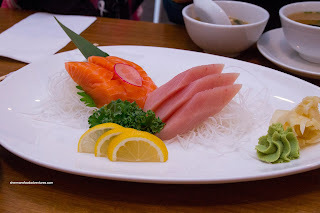 We started with the Appetizer Sashimi presented on a really large plate. The somewhat large slices of fish were pretty good. I found the salmon to have a nice rebound as well as tasting fresh (as fresh as flash frozen can get). As for the tuna, it was soft while still firm enough to not be mushy. It is worth noting that they were generous with both the ginger and wasabi. Plated attractively and with a bonus wakame salad in the middle, the Midnight Sun Roll was decent. 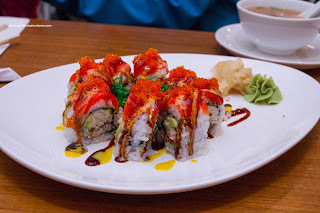 Consisting of crab meat, avocado, cucumber and unagi in the middle with sockeye salmon and tobiko on the outside, there were many textures and flavours at play. I found the rice a tad firm with only the mildest of flavour. Morever, the whole thing wasn't overdressed with sauce. 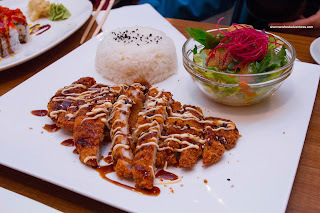 Also on an oversized plate, the Tonkatsu was served with rice and salad (as well as a miso soup). Theis was an impressive portion size of 2 pork cutlets which made this a decent value at $8.95. Although the pork cutlets were fried crispy, the meat itself was a little on the dry side. Furthermore, we found that there was a lack of tonkatsu sauce (but we could've just asked for more). To our kids' delight, the Prawn Tempura was large enough to justify its big serving plate. Although super crispy and light on the outside, the batter in between the exterior and prawn was a touch floury. 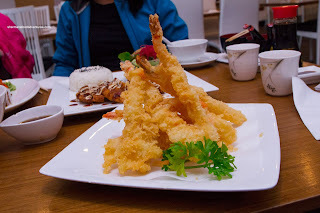 The ebi itself was indeed large and had a nice meaty texture. 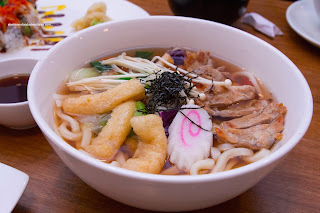 The kids shared a Chicken Udon and it was a pretty typical non-Japanese version consisting of a tonne of veggies. The use of green and red peppers was peculiar because it tainted the light flavour of the dashi broth. Rather than being just a light sweetness, it had a green pepper aftertaste. Also, the chicken was super dry and chewy. Despite the large portion size, this was not a good dish. 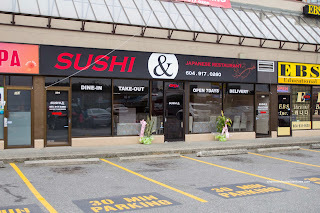 Sushi &, Sushi Ampersand, Sushi And or whatever the place is called, it was decent enough at a reasonable price - warrants another visit.